The face on this foil chocolate is exactly how I feel at the moment. Too many outrageous service issues this week that miraculously disappear and are resolved when I turn into “I will eat you alive if you do not handle this logically mode.” I will definitely be a call center representative fielding calls from irate customers in my next life… At least I will be able to fling it right back. Or I will turn into a cockroach when reincarnated. Harumpph. 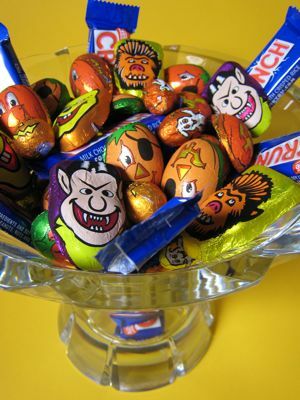 Before certain holidays (Halloween, Christmas & Easter), we like to have a nice bowl of seasonally appropriate candy on a table by the front door for visitors (or residents! )… It’s usually a small bowl filled with goodies and various high cholesterol options. This year I was thrilled to find Halloween themed foil wrapped chocolates at Rustan’s Rockwell. It’s really more about the look and not the quality of the contents… Some of the packages of Palmers Halloween chocolates were a reasonable PHP60 or so. Others went as high as PHP180. They will be nibbled on until the 31st, at which point they will be given out to The Kid’s friends if they actually still head out to trick or treat. Or if they are too old for that, they can give the candy out to the hundreds if not thousands of kids that come by. For the crowds that typically come by each year, we do try to offer more than the run of the mill loot. This year we went to Divisoria to stock up, and eschewing all “made in China” candy (due to poisoning problems a few weeks ago down South), we stocked up on Korniks, Oishi, Gum, Nips and other candies. I try to overdo the volume on purpose as I hate running out. I realize there are some who wonder why we have adopted this holiday, and for me, the simple answer is kids and candy…it’s as simple as that. I have previous posts which cover a very brief history of the holiday, last year’s festivities, The Kid’s couture costume, chocolate cookies for Halloween, and even decorative gourds with a holiday feel and one on pumpkins, which are now available in selected metro groceries. I am few years short of social security eligibility benefit recipient and I still dress up and go out trick or treating on Halloween! I am not ageless but I am here already and I believe Halloween is for everybody to enjoy. In fact, I am shooting for the best costume in the office comes Wednesday October 31st. I hope I will bag the trophy this time. Wish me the best of luck. 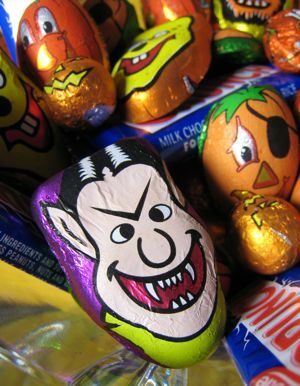 I love the wrapping of your candies â€“ spooky, eerie and devilish look. I, for one avoid buying any food products from China since contamination incidents. I love though the way they handle the case of their corrupt health minister. After their fact-finding, they did not give him a chance they executed him â€“ zero tolerance! i will buy those chocolates today. i am also a halloween person. i even told our hotel decorator not to put any xmas decor yet coz it will clash with my halloween decorations.in iloilo we celebrate halloween by going out to the bars. happy halloween guys. I love Halloween. Last year was our first Halloween here and we headed to Ayala Alabang where our friends live to see the trick-or-treaters and hand out candy (there is no trick or treating where we live). I was STUNNED by the number of people who came!! There was a line at the door. We had four laundry hampers filled with treats (little bags of candies, nuts, and chips) that were gone in a little over an hour! This was also the first time I had seen adults trick or treating. In the states, you usually stop at about 12 or so and here we had people well into their 60s (who seemed to not be with any kids). We will head back down there again this year because for us it is not Halloween without kids, costumes, and candy. Growing up in SF we were the house that gave out either boxes of raisins, toothbrushes, or nickels. totall agree, Cumin and MM. that’s why it’s dangerous for me to go out and buy candy this time.. io’m sure i’ll end up eating all of them in disgust, frustration, anger, etc..etc. MM, tell me when you see foil-wrapped chocolates with the texas chainsaw guy’s picture in them. I am with you, MM, when it comes to the call center stuff. They are not allowed to say they “don’t know” even if they obviously don’t and just give me dead air. But I do like your faces on your halloween chocolates. It’s very much into the spirit. Hope they have it in Rustan’s Shang. Cumin, I blacked out the news (all media) during the day of Erap’s release. That was the only way I could handle it. Erap will enjoy this blog, that is if he can really read. Well there are pictures of food for him to look at. I am also outraged with the pardon drama. Feed them tiessa! Lee, sayang ang tiessa. Feed them hell I say. Unang-una si Erap and company then the rest. And like zena, I absolutely refused to listen to anything even remotely referring to his release soon as I heard about it. It’s just not worth anything anymore. As for this halloween, aliw lang ako. But we never did celebrate it maski ngayon that I already have my own family. Just my kid in school whenever they have a halloween party. Just can’t relate to it. Basta, when the ber months come along, puro Christmas lang ang feel namin. And on the day of the saints and dearly departed souls, we simply pray for them. we really don’t have trick or treating in our village, but i do prepare some goodies for my 3 pamangkins, the foil chocolates looks cute to me, hope to drop by rustans to get some, it might run out soon. Halloween is widely practiced in the village where we used to live,it’s fun except that on the day itself, expect a HUMONGOUS TRAFFIC JAM, hundreds of cars lining up at the village gate and even jeeploads. I do understand the analogy between kids and candy but I noticed(even the resedents themselves)that it’s more of the grown-ups who ‘outrace’ the kids to the treats…on an interesting note, our neighbors have always been ‘nationalistic’ on this very western tradition, with their treats: they would put up ‘dirty ice cream’ carts, cotton candy carts, some would offer fishballs/squidballs, ice drops and the like…it’s like a ‘mock’ fiesta everytime on halloween! Cumin, I am totally with you down to the chopping board. A chopping block would just be too quick. The chocolates look cute! I’m ordering their snowman and santa foil wrapped chocolates for christmas naman. How many lbs is the pack of palmers plain milk chocolate that costs Php 60? Mura sya dyan kesa dito kung 1 lb yun. Got the same treats at rustan’s shang. I also loved the marshmallow covered ones with different ghoulish designs and the big eyeballs :) I’m sure the kids will be thrilled to get these treats. my kids and i would love to go trick or treating at your door! just tell me where hehehe :) happy halloween!